The concrete footing details in most cases are the only communications between the structural engineer and the contractor on site. This is especially true in residential construction where footing detail and footing design are kept to a minimum. This poses a challenge as to how well the designer’s intend depicted in a spread footing detail for post footings pr pier footings are interpreted in the field. Whether the footing detail is for post footings at a commercial building or pier footings at a house the detail must be clear and simple to understand. But the clarity and simplicity of any footing detail is heavily dependent on the contractor's experience and sophistication which can be elusive for the normal concrete contractor. To illustrate the importance of interpreting designer's intend represented by a detail, consider the footing detail shown below. This detail was one of the biggest footings that I had estimated and constructed. The footing size 30'-0"x98'-0"x12'-0", (30 feet wide, 98 feet long, 12 feet deep). There were 4 of these for a one 10 story office building built near an earthquake fault line. The reinforcements were as massive as the footing themselves, #11 @ 6" o.c. each way double mat top & bottom with additional #9 @ 9" o.c. each way spaced 9" o.c. vertically. The vertical reinforcements were #8 @ 9" o.c each way. 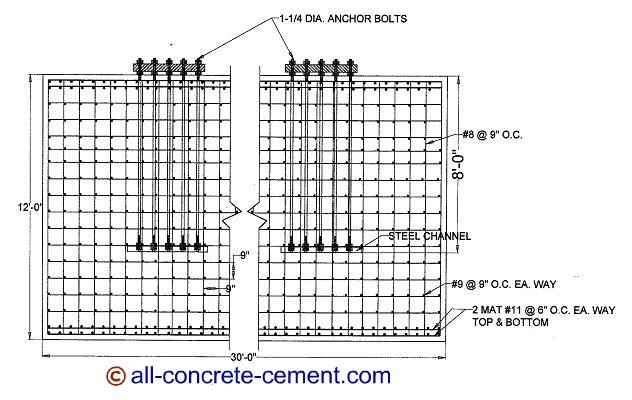 Estimating the required quantities of rebar, concrete , and types of anchor bolts along with steel embed channels all require extensive knowledge for interpreting footing details. The normal home building concrete contractor will find that constructing such footing detail require great a lot of planning. Unlike a normal house footing that takes 2 days max to form and pour, this can take weeks. The biggest challenge in constructing this footing was ensuring that the anchor bolts along with the embedded steel are anchored precisely at the desired location without movement during pour. Next to that challenge was the fear of blow out due to the fact that ties had to be special made and there was no guarantees they would work.